Recommended K-college. 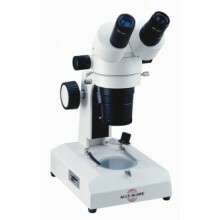 This professional quality full sized microscope delivers crisp sharp images with high resolution. The binocular body is inclined 45 degrees and rotates 360 degrees. The head is adjustable for interpupillary distance and diopter adjustment for differences in vision. The eyepieces are W.F. 10X with a viewing field of 21mm. The optics are high quality and hard-coated for maximum performance. The focusing is smooth by rack and pinion with a built in slip clutch system and safety stop at the lower end of the traverse. Easily rotatable turret for rapid magnification change. The illumination system is halogen incident light from above and fluorescent transmitted light from below operated by a four way switch. Frosted and black/white stage plates are included. Acid and scratch resistant oyster white finish. Comes with a five year manufactures warranty. Click the button below to add the Accu-scope 3069 Stereo Microscope Series to your wish list.